Imagine you and your faithful companion out hiking on a warm beautiful day. You've brought water for you both, yet only a snack for yourself. Most likely it is a trail mix or a granola bar with raisins. STOP, don't give your dog any! Raisins are on the list of foods poisonous to dogs! So what are you to give your walking partner? You guessed it, double banana and peanut butter trail mix dog cookies. These have been people tested, too. They aren't as sweet as other energy bars, but you won't miss the sugar knowing that you can share a healthy treat with your dog. In a large bowl, vigorously whisk olive oil and brown sugar until smooth. Stir in peanut butter and blend well. Mix in banana and egg white. Add flour, milled flax seed, cinnamon and baking powder and stir (preferable with a sturdy wooden spoon) until well combined. Add oatmeal and stir until a dough forms. Combine pumpkin seeds, almonds, pecans, peanuts, cranberries, pineapple, banana chips, and carob chips together in a small bowl. Stir homemade trail mix into the batter. Scoop dough with a 1 inch cookie dropper. Lightly roll ball in your hands and flatten into a cookie shape. 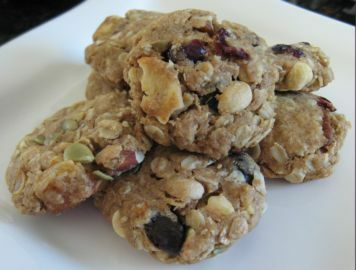 Storing & Yield: These trail mix cookies will last for two weeks in the refrigerator. You can freeze them for up to four months. For more information on storing homemade dog treats be sure to review our tips and techniques. The yield depends on what size cookie dropper you use and how tightly you pack each cookie. You should be able to make 3 dozen dog cookies with a 1" scoop. Olive Oil - If the dough is not coming together after adding the dog safe trail mix, you can add one tablespoon of olive oil. But be sure to really get in there and stir, stir, stir. It is suppose to be loose. Loose Dough - Speaking of a loose or crumbly dough.......You will need to press the dough firmly into the cookie scooper. I have found that using the side of the bowl works wonders. Scoop more dough than you think will fit in the scooper then press firmly on the side of the bowl. With your hand, brush off any extra dough back into the bowl. It's not a science, but this should help your cookies stick together. 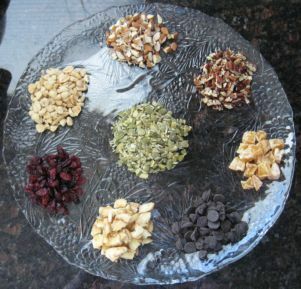 Commercial Trail Mixes - Manufactures do not have our dogs in mind when making trail mix. So, most commercial trail mixes will contain raisins. You might be tempted to buy a trail mix and then pick out all the raisins, but that is a dangerous game. If you miss too many, your dog pays the price of an upset tummy, or worse. Play it safe and make your own dog safe trail mix. A little extra work and you, and your dog, can rest easy.